Nov. 2, 2017, 8:52 a.m.
By Laura Hazard Owen @laurahazardowen Nov. 2, 2017, 8:52 a.m.
People who subscribe to dozens of podcasts may forget that there is indeed a podcast learning curve. For people who’ve never listened to podcasts before, the technology may feel like enough of a hurdle to to induce them to skip them all together. Meanwhile, those who do subscribe to a lot of podcasts know how long that list of unheard episodes can get, coming to seem as unmanageable as an overflowing email inbox. The French startup Hack the Radio tries to tackle both these problems. On the one hand, it hopes to make podcast listening less intimidating for newbies. (Sixty-one percent of French people have never listened to a podcast, according to research done for Audible earlier this year. The figure is similar in the United States, where 60 percent of people ages 12 and older have never listened to a podcast.) On the other hand, it aims to improve the listening experience for people who already consume podcasts. Fillot, who worked at Radio France’s Le Mouv’ (the French public radio station aimed at young people) for several years, is the founder and CEO of Hack the Radio, a French startup that just won the first annual Next Journalism Prize, which “aims to reward long-term innovations and risk-taking in the field of media.” The prize is sponsored by the French journalism school Centre de Formation des Journalistes (CFJ) and the Nieman Foundation, of which Nieman Lab is a part. Its goal is to encourage European journalists — whether they’re just out of journalism school or mid-career — to work on more entrepreneurial projects, explained Florence Martin-Kessler, a CFJ board member, cofounder and editor-in-chief of Live Magazine, and a 2011 Nieman Fellow. The prize doesn’t come with money; instead, the winner receives a trip to the Nieman Foundation to workshop their project with Nieman fellows and staff, and gets visibility and mentorship within the Nieman and CFJ networks, including the chance to pitch the idea to French media executives. Working at Radio France, Fillot had started wondering how audio listeners could have more direct relationships with audio providers. Combining that question with the aforementioned problems with podcasts, she conceived of a Facebook Messenger chatbot that would deliver news and help people — especially those who hadn’t listened to podcasts before — discover relevant audio content by chatting with them about what they’re interested in. Hack the Radio combines an API with French- and English-language podcasts and radio content, selected by humans, to deliver those recommendations. The content can be played from an audio player within the chatbot, removing the need to figure out how to download a separate podcast app and subscribe to podcasts from within it. 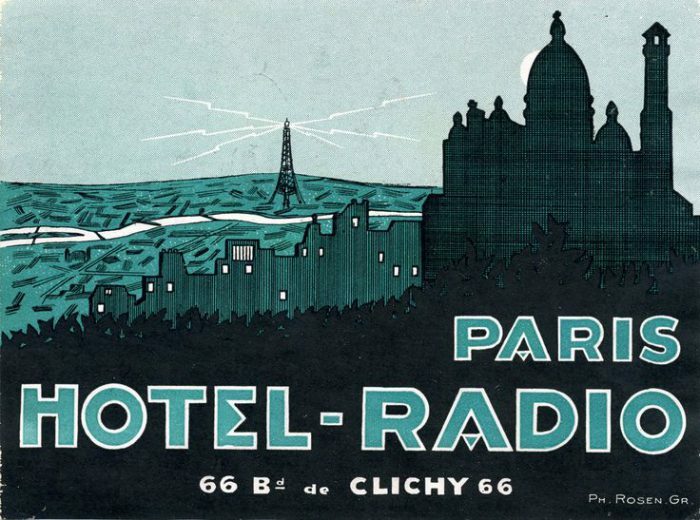 Vintage Paris Hotel-Radio luggage label from the collection of Tom Schifanella, Art of the luggage label, used with permission. POSTED Nov. 2, 2017, 8:52 a.m.
Owen, Laura Hazard. "Hack the Radio, a French startup, aims to liberate podcasts by streaming audio from a chatbot." Nieman Journalism Lab. Nieman Foundation for Journalism at Harvard, 2 Nov. 2017. Web. 24 Apr. 2019. Owen, Laura Hazard. "Hack the Radio, a French startup, aims to liberate podcasts by streaming audio from a chatbot." Nieman Journalism Lab. Last modified November 2, 2017. Accessed April 24, 2019. https://www.niemanlab.org/2017/11/hack-the-radio-a-french-startup-aims-to-liberate-podcasts-by-streaming-audio-from-a-chatbot/.